It’s 6 in the morning on Black Friday, and I have leftover holiday punch warming on the stove and the 9×13 pan of sweet potato casserole calling to me from the fridge. But I can’t answer that sweet siren song quite yet: I’ve got to get some holiday shopping done. For me, Black Friday is always the day I realize that Christmas is coming and spending another afternoon hanging more twinkle lights won’t delay it. As I mentioned last year, most of my friends and family aren’t avid readers. Moreover, four of the people I’m giving gifts to this year will get their packages by mail, and books are expensive to ship! So this year, I’m focusing a little bit less on the “book” and a little bit more on the “ish” part of bookish. These are gifts that work great for the readers and the non-readers in your life. 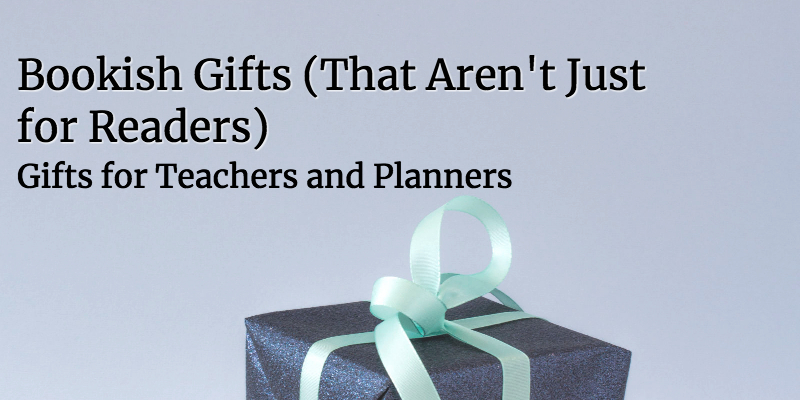 I’ve sorted today’s recommendations by two categories that many of my friends fit into: gifts for teachers and gifts for planners. Many of my friends are teachers, and I love buying gifts for them. Often, though, they don’t really have time to read during the school year. This Christmas, I’ve got some perfect gifts that work for all the teachers in my life. I have never been as addicted to a pen as I am to the Pilot Juice. I’m not a pen snob, I promise. At least, not normally. But now, for the first time in my life, I will only reach for these pens. They’re incredibly smooth and rich-colored gel pens (especially the darker colors)– most of the reviews online deal with the .38 mm, but I prefer the .5 mm, for what it’s worth. Here’s a link to the best video I found showing the colors of the .5 mm. For the record, I really don’t like the Pilot G2’s, which are usually the only Pilot pens that show up in stores– at least on the East coast– so don’t compare them. The Juices, as far as I can tell, have to be ordered online, and I’d recommend buying individual colors instead of sets. The best prices I’ve found are at JetPens: the pens cost $1.80 each. Also at JetPens: these lined, translucent sticky notes that make writing on student work a breeze. To be honest, I think these would work for almost anyone. I showed them off to my partner, an avid home cook, and he immediately said “Those would be perfect in my cookbooks.” They’re $6.50, which is pricy for a post-it note (trust me, I know: I order my cheap canary yellow Post-Its in bulk), but to me, it’s worth paying a little extra for such a simple gift that I know will get used. I bought a set of the whale-shaped ones for myself, and when I returned some student work with the paperclips attached, so many of my kids exclaimed over them. What I love most about these clips is that they are absolutely functional— I hate office products that look cute but don’t actually do what they’re supposed to (I’m looking at you, typewriter-shaped Post-Its). These work great, and they come in a bunch of different shapes, including dogs, cats, apples, and airplanes. Analog planning– especially bullet journaling– has become insanely popular in recent years. Many planners are readers– I love using my journals (yes, plural. It’s a sickness.) to track my reading stats, although I also use a spreadsheet— but many planners just aren’t that into books. Fortunately, these gifts work for both readers and non-readers (the pens, post-its, and paperclips I mentioned up above would also be great gifts for planners). Leuchtturm 1917‘s are good, solid choices, but Scribbles That Matter has thicker paper. My personal favorite (and the most expensive, obvs) are the Nuuna notebooks, although they don’t have page numbers, which matters to some people. The Tombow Fudenosuke Brush Pen set is less than 5 dollars on Amazon, and they are easily some of the best brush pens on the market. They work really well for hand-lettering, especially if you’re just learning (I did this year’s Thanksgiving name cards with these pens). For more colorful and versatile pens, Tombow also makes dual-brush pens (each pen has two tips: a brush and a bullet) that many planners use to write, color, and hand-letter with. Their pastel shades are the most popular set. Etsy is the place to go for handmade stickers– my personal favorite shop is StickerDoodle because her designs feel both whimsical and sophisticated. They’re stickers . . . for grown-ups. Etsy has plenty of decorative washi tape and planner stickers for every aesthetic; although it may take a while to wade through all the search results for something your giftee will love, I find surfing Etsy super fun. Those are my recommendations for gifts that teachers and planners will love, no matter how they feel about reading. I hope they help you this busy holiday season! If you have other types of giftees that you’d like bookish recommendations for, just let me know in the comments. And tell me what your favorite bookish shop on Etsy is– I’m always on the hunt!